Function and aesthetics don’t have to be either/or in dentistry. Sometimes, it can seem like the challenge to strike an equal balance between the two is impossible for certain cases. When patients have their heart set on aesthetics, yet they have much more pressing functional needs, we must find a way to meet their goals while improving their health. In this post, Dr. Hulme describes how he did just that with a patient who didn’t want to go through the extent of dental interventions needed for his functional issues. This 32-year-old high school teacher wanted an aesthetic change, not realizing the functional concerns his particular case presented. With a cross bite and excessive wear for his age, we discussed an option for ortho/restorative combination case. However, the patient was opposed to orthodontic discipline. He had some chipped teeth due to some trauma he incurred in college that continued to be his primary concern. 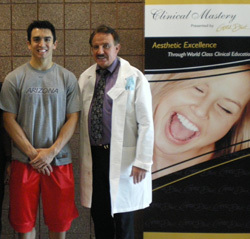 We developed a plan to treat him at Clinical Mastery’s Full Mouth Rehabilitation program. 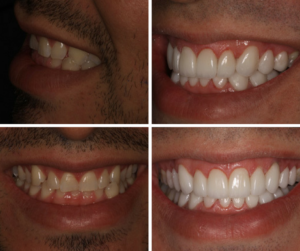 This plan had to resolve his functional needs without the use of ortho. We prepared and seated a total of 20 Empress units fabricated by Gold Dust Dental Laboratory to achieve this outstanding result. My patient was thrilled and I enjoyed a comprehensive program with many other clinicians from across the country and globe. It sharpened my skills and elevated my expertise in treating complex cases. You can see from the images that the final result is a drastic change based on where the patient began. It was rewarding to help him toward a more satisfying smile.